In summer 2000 (July), together with my family, when just being 5 years old, I did my first peak, Monte Tamaro (1,961 m) in Sottoceneri (SUI). I was overwhelmed by the beautiful view on the mountains and the Lago Maggiore and I felt like on top of the world. On the way, like some treasure hunting, I found my first crystals which were the start of my collection of some crystals and fossils. I did my first climbing route by rope in July 2001. It was Rita Pavone (5 b, TR) in Maccagno (ITA), Palestra di roccia comunale, sector Stadium. I was immensely proud after a brave fight (with some sand on the holds) and after having succeeded on first go without falling. In the following years until 2006 I continued sport climbing in a playfull manner with my family, once or twice a week. In October 2002 I made my first experience with retreating because of weather conditions on Pizzo Centrale (2,999 m) at San Gottardo region (SUI). On the S-ridge there was fresh falling snow. My father and I decided to reverse short below the peak (ascended then July 22nd, 2003) because of the danger of slipping and of small avalanches already coming down. During my holidays in 2003 and 2004 I continued with some mountaineering. On Piz Terri (3,149 m), Valle di Blenio (SUI), W-ridge, July 26th, 2003, I had a splendid view up to the Valais Alps (Monte Rosa etc.) and I wanted to climb all mountains of the world. On Pizzo Campo Tencia (3,072 m), Valle di Prato (SUI), E-ridge, July 30th, 2003, I realised that I am pretty quick and deft on mountains with scree and firn (somewhat like a “mountain goat” ;-)). When trying the Basodino (3,272 m), Tessin Alps (SUI), intended was the NNW-ridge, October, 2003, together with my father, we found dense fog and problems with wet conditions and orientation. This, on high alpine region, provoked really intense existential feelings in me and it was good having my father aside. We decided for reversal below the glacier (peak ascended then August 3rd, 2004, together with Ruben and my father, with quick descent because of rain, graupel, St. Elmo’s fire and finally electrical storm, which was a “hair-raising” experience ;-)). The day, before we did the Rheinwaldhorn (3,402 m), Adula Alps (SUI), NNW-ridge, August 8th, 2004, it was incredibly hot during the ascent from Val Soi and I was just about to return. But then, early in the following morning from Capanna Adula (UTOE), we made a quick ascent to the peak, faster than all adults. My brother Ruben and I got big applause when returning first to the alpine hut even though we had been a bit lazy (as always) when getting up and not rather starting on the “pole position”. Of course we were proud like peacocks ;-). When visiting the Bergfilm-Festival, Dresden (GER), November, 2004, Ruben and I got very impressed by the Film “THE TRIP”. This film tells the story of four young climbers on their ultimate Euro trip between the North Cape (Norway) and Tarifa (Spain). We got really psyched and wanted to do the same all over the world by mobile home with friends when grown up. 2005 became the year of my decision to concentrate on sport climbing, even though I started the year with some ice climbing together with Ruben and my father, i.e. Rechter Doppellutscher (Ice 4), Sportgastein, Gasteiner Tal (AUT), March 25th, and at that time I still wanted to try all different types of climbing. During this year, 2005, I also did some traditional climbing in the Sächsische Schweiz (GER), i.e. Klavier direkt (VIIc RP), Daxenstein, April 16th, or Windschatten (VIII b RP), Langes Horn, Großer Zschand, August 17th (together with Krista Rohde †), or Eiserne Maske (VIII b RP), Wartburg, Kleiner Zschand, August 20th. 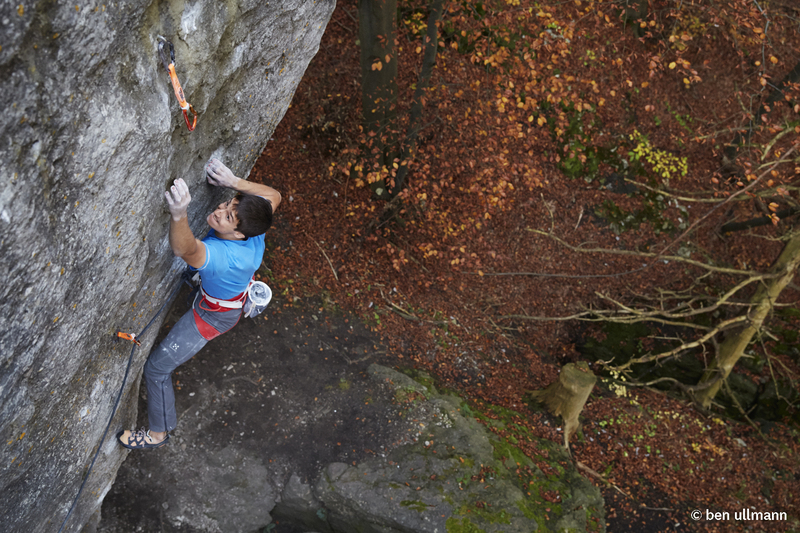 I also tried some boulders in Fontainebleau (FRA), Bas Cuvier, circuit orange, i.e. Le tire bras (fb 4a OS), May 28th, La jarretelle (fb 4a OS), May 29th, or at Cresciano (SUI), i.e. senza nome (fb 6b RP), Danilo, July 21st. Sport climbing rock routes at that time were for example I Cigini di Campagna (6b+ RP), Maccagno (ITA), July 19th, in my home region Strubich (VII- RP), Bodensteiner Klippen (GER), April 9th, (it was beautiful to lie in the sun on top of this limestone and to enjoy the fields and the landscape around) or Drachentöter (VII-/VII RP), Drachenwand, Holzen, Ith (GER) in October this year. An impressive experience in 2005 was to climb on the Allalinhorn (4,027 m), Valais Alps (SUI), E-ridge (Hohlaubgrat), August 5th, together with Ruben and my father. In our small rope team my father allowed me to be most of the time in the lead, even on a snow free ice passage on the ridge above the south wall after a heavy storm the day before, when all the rope teams had to return at last at this point. But thanks to the ZAMG (weather forecast in Innsbruck, AUT) we found a good day to succeed with our enterprise in this magnificent world of the mountain giants in the Valais. We were very quick again with our ascent and experienced on our way down an impressive natural spectacle with the drop of a part of a hanging glacier only a few hundred meters away from us and with a huge wave of snow dust coming in our direction. Nevertheless, by the end of this year (December 31st, 2005) during some lead and top rope training on different types of ice in the Froschmaul (Ice 4), Harbach Graben, Gasteiner Tal (AUT), Ruben and I finally made the decision to go furthermore first of all for rock sport climbing, because alpine climbing possibilities were too far away from our home and sport climbing in the low mountain range could be done on a more regular basis from where we lived in Northern Germany (Hannover). So, from 2006 on, I began to concentrate on rock sport climbing, including also some deep water soloing (DWS) this and the next year in Mallorca (ESP). My development since then can be found on 8a.nu.